The press reports that the Association of Community Organizations for Reform Now (ACORN) recently submitted a voter registration form filed under the name “Mickey Mouse” to the Orange County, Florida, board of elections. Fox News co-anchors Megyn Kelly and Bill Hemmer, hosting the “straight news” program America’s Newsroom, mock ACORN for filing the form. Under Florida law, ACORN is required to submit all voter registration forms even if it suspects they are bogus: failure to submit a voter registration form is punishable by a $1,000 fine. Kelly reports the form submission, and Hemmer reports that the form was rejected, saying, “ACORN says they are required to turn in every application that is filled out, even if it says Mickey Mouse.” Kelly then says: “I love that, they’ve got the obligation to submit it no matter what it says. Mickey Mouse, Jive Turkey, which we saw yesterday. How are we to know?” ACORN official Brian Kettenring tells a Tampa Bay Times reporter, “We must turn in every voter registration card by Florida law, even Mickey Mouse.” The liberal media watchdog organization Media Matters cites the pertinent Florida statute: “A third-party voter registration organization that collects voter registration applications serves as a fiduciary to the applicant, ensuring that any voter registration application entrusted to the third-party voter registration organization, irrespective of party affiliation, race, ethnicity, or gender shall be promptly delivered to the division or the supervisor of elections.” If a third-party voter registration organization such as ACORN fails to submit any voter registration form, it is liable for a “fine in the amount of $1,000 for any application not submitted if the third-party registration organization or person, entity, or agency acting on its behalf acted willfully.” Kettenring says he is not sure the “Mickey Mouse” voter registration form came through ACORN, though it bore a stamp indicating that it was collected by someone affiliated with the organization. ACORN has come under fire for problems with some of the forms submitted by its employees, including 35 voter registration forms submitted in Pinellas County, Florida, that the Pinellas Board of Elections considered questionable. Recent forms submitted by the organization in Las Vegas listed the names of the starting lineup of the Dallas Cowboys. Republicans are claiming that the “Mickey Mouse” submission and others are part of a nationwide conspiracy by ACORN to subvert the electoral process; Republican National Committee (RNC) counsel Sean Cairncross says that ACORN is a “quasicriminal organization” engaged in “a widespread and systemic effort… to undermine the election process.” Kettenring says that a few of ACORN’s paid voter registrars are attempting to get paid by submitting forms that are clearly not legitimate. ACORN says it fires canvassers who forge applications, citing a recent firing in Broward County of one worker who turned in applications with similar handwriting. The organization alerted the county’s election supervisor to the problem. ACORN pays $8/hour for canvassers to register votes, and does not pay bonuses for volume or a specific number of signatures. The organization says officials call each name on the forms to confirm their legitimacy, but under Florida law must submit even problematic forms. [Tampa Bay Times, 10/14/2008; Media Matters, 10/14/2008] In March 2008, Fox reporters misquoted a Washington state official regarding allegations of ACORN-driven voter fraud (see May 2, 2008). Seven days before the Fox News report, officials raided the Nevada offices of ACORN in a fruitless attempt to find evidence of voters being fraudulently registered (see October 7, 2008). Four days after the report, independent factcheckers will find allegations of voter registration fraud leveled against ACORN to be entirely baseless (see October 18, 2008). Five days after the report, a Fox News guest will accuse ACORN of causing the subprime mortgage crisis (see October 19, 2008). And in 2009, Fox News host Glenn Beck will accuse ACORN and President Obama of working together to create a “slave state” within the US (see July 23, 2009). President-elect Obama and his family, acknowledging his election victory. From left: Barack Obama, his daughters Sasha and Malia, and his wife, First Lady-elect Michelle Obama. [Source: Hollywood Reporter]Senator Barack Obama (D-IL) wins the 2008 election for US president. He replaces President George W. Bush, a Republican. Obama becomes the first African-American president in the history of the US. He defeats Senator John McCain (R-AZ) by a 52 percent to 46 percent margin in the national popular vote, and by a 365-173 margin in the electoral vote. The Democratic Party also increases its lead in the Senate, with a 56-41 margin, and a 255-175 margin in the House of Representatives. Finally, Democrats gain a +1 margin in the nation’s 11 gubernatorial elections. 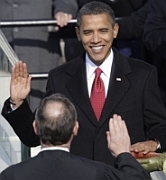 [National Public Radio, 11/2008; United Press International, 11/5/2008] Obama will begin his four year term as president on January 20, 2009, after a transition period (see January 20-21, 2009). US Senate candidate Al Franken (D-MN) is confirmed as the winner of the Minnesota Senate race over incumbent Norm Coleman (R-MN) after over a month of vote recounting and legal maneuvering by both sides. Coleman was initially declared the winner, but Franken immediately requested a recount, as the vote margin was very close (see November 4-5, 2008). Franken is declared the winner by 225 votes out of 2.9 million cast. The final totals: Franken with 1,212,431 votes and Coleman with 1,212,206 votes. Third-party candidate Dean Barkley also garnered a significant number of votes. Coleman says he intends to file a lawsuit challenging the results, blocking Franken from being seated in the Senate. Coleman’s attorney Tony Trimble says: “This process isn’t at an end. It is now just at the beginning.” Senate Minority Leader Mitch McConnell (R-KY) says, “The race in Minnesota is not over.” Franken says, “After 62 days of careful and painstaking hand-inspection of nearly 3 million ballots, after hours and hours of hard work by election officials and volunteers around the state, I am proud to stand before you as the next senator from Minnesota.” Both sides mounted an aggressive challenge to votes, with campaign officials challenging thousands of ballots during the recounts. Franken made headway when election officials opened and counted some 900 ballots that had erroneously been disqualified on Election Day. Coleman says some ballots were mishandled and others were wrongly excluded from the recount, thus denying him the victory. His loss was made certain when the Minnesota Supreme Court refused to change the totals of the recount (see December 24, 2008). The state Canvassing Board, the entity in charge of the recounts, votes unanimously to accept the totals as final. Franken’s lawyer Mark Elias says of Coleman’s promised court fight: “Former Senator Coleman has to make a decision. And it is a profound decision, one that he has to look into his heart to make: Whether or not he wants to be the roadblock to the state moving forward and play the role of a spoiler or sore loser or whether he wants to accept what was a very close election.” Senate Majority Leader Harry Reid (D-NV) says, “The race in Minnesota is over,” and calls Republican efforts to continue challenging the result “only a little finger pointing.” However, a spokesperson for Reid says Franken will not be seated when Congress convenes later in the week. Senator John Cornyn (R-TX) warns that any attempt to seat Franken would result in “chaos.” Trimble says that the recount was handled poorly, and there “can be no confidence” in the result. The seat will remain unfilled until Coleman’s legal challenge is settled. [Bloomberg, 1/5/2009; Associated Press, 1/6/2009; Minneapolis Star-Tribune, 1/6/2009] Republicans in the Minnesota legislature have speculated on the possibility of Governor Tim Pawlenty (R-MN) appointing someone, presumably a Republican, to take the Senate seat on a temporary basis while the recount plays out, but Democrats, who hold the majority in the legislature, say they will block any such efforts. Legal experts say Pawlenty’s legal authority to make such an appointment is dubious at best. [Minneapolis Star-Tribune, 1/6/2009] Later press reports will state that Franken’s margin of victory was 312 votes, after a judicial panel reviews the recount totals. [Minneapolis Star-Tribune, 4/22/2009] Coleman files a lawsuit to block Franken’s victory (see January 7, 2009).